I am not sure on the floor stain color. Let me see if I can find out for you. How is the corner of the tile finished? Not bullnose or schuler strip? 14. Tile the back of your island. I'm a huge fan of this treatment. 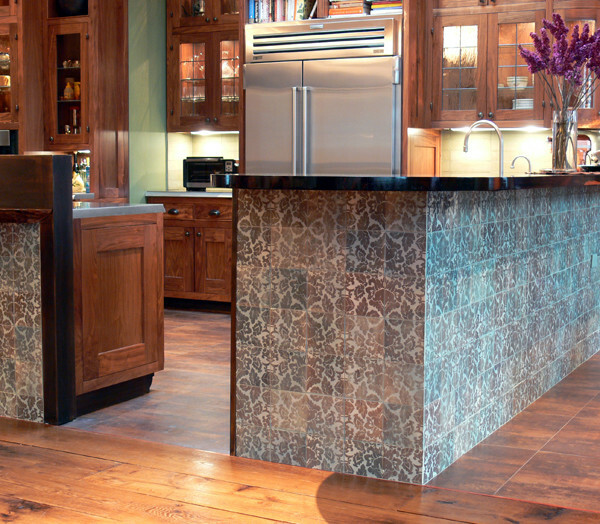 If you have an island or peninsula that's just painted drywall, tile can take it from ho-hum to stunning. Go with a patterned tile or classic subway — anything goes. 9. Adopt pattern. Covering the base of your island with patterned tile, like the lovely damask design shown here, is a simple way to transform a ho-hum space into one that's unique and eye-catching. Have a pretty wallpaper you’d love to use instead? Wallpaper can work beautifully, but you will need to have it covered with a sheet of clear acrylic to protect it from damage. Filmore Clark 9. Adopt pattern Covering the base of your island with patterned tile, like the lovely damask design shown here, is a simple way to transform a ho-hum space into one that’s unique and eye-catching. Have a pretty wallpaper you’d love to use instead? Wallpaper can work beautifully, but you will need to have it covered with a sheet of clear acrylic to protect it from damage.